Today's stitch and stitched sample may look very familiar to you. It's a cute stitch that happened to be in the background of a recent post. 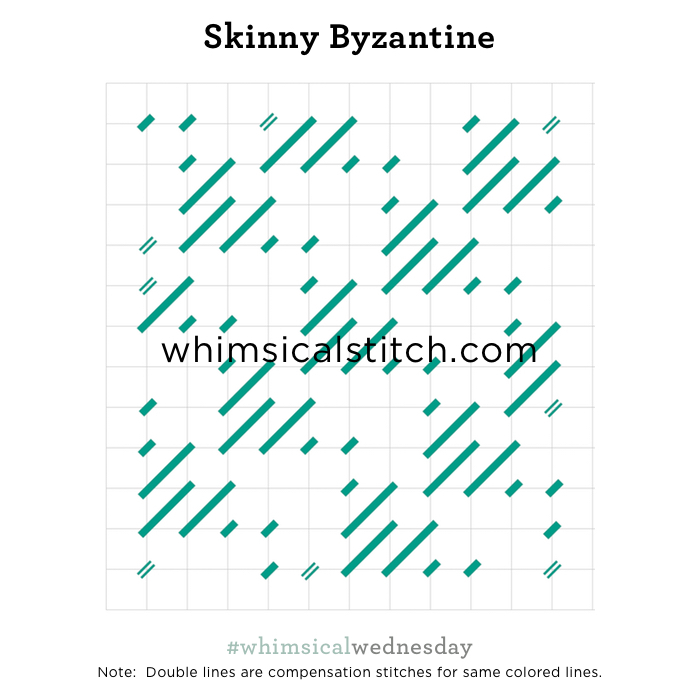 I named it Skinny Byzantine because if you stitched all the stitches over two rows, it would be a small Byzantine stitch. That is also a guide to how the stitches match in subsequent diagonal columns. All stitches over two rows are aligned on the diagonal as well as the stitches over one row. The stitched sample uses two plies of silk floss on a Rebecca Woods stocking (18-mesh). I would love, love, love to see this as a tiny body of water with Petite Silk Lame or a lightweight Kreinik. It would also make a lovely cloud with silk floss or silk perle. In addition to walls (as illustrated on the stitched sample), other architectural elements that it would be great for include pathways or roofs.